Yes, there would be a surprise at the end so bear with me a little and you could be one of the lucky readers that would be shipped off to the magical land of OZ with Hello Kitty! If you are too lazy to read this lengthy blogpost, skip down to the video to watch the summary lol. I'm pretty you guys are already planning to head down to Johor to visit legoland this school holidays, i can recommend a decent strategic place to stay and also provides free shuttle services to & fro from the hotel lobby. And the best part about this hotel aside from the comfy rooms, well equipped facilities, good food, it is exactly 300m (walking distance) to Sanrio Hello Kitty Town! So now you can kill 2 birds with one stone, aside from just legoland you can also pay hello kitty a visit. Upon arriving at our rooms, the obvious blogger thing me & my awesome roomie, Laura from Winter Blossoms did was to take pictures of the whole place before we even dare to jump on the bed lol, typical scene hor? Before doing anything sure take pictures and upload, confirm can tell this person is a blogger already lololol. Here in Hotel Jen you'll be greeted by their friendly staffs who are more than willing to help you with your luggage and even provided us with huge umbrellas because it was raining upon our arrival. Feel so classy man, got someone waiting for me at the bus steps with an umbrella *perasan lol*. What's funny about their hotel register counter is that it's located on the 1st floor alongside with their restaurant, so when you arrive at G floor, just take an escalator up (or the lift). Bathrobes and and ironing board with steam iron provided in each room. I want to bring home this mirror! Loving my room so much, not only because i had a fun roommate to gila with (we laughed so hard at the bahasa ver. of Legend Of Korra lololol) it was because it came will furnished like a suite already! It has a huge study table, sufficient amount of charging ports (can never have enough these days lol), ironing board with steam iron, fancy toilet that has complete set of toiletries, huge mirror with lights and last but not least a clean bathtub for us indulge in. 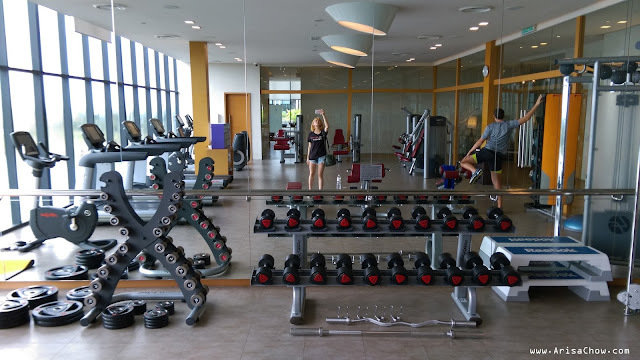 After dropping off my luggage the first thing i did was to check out their gym, as i heard from friends that Hotel Jen's gym has one of the nicest views overlooking the harbour where yachts are docked. So it was just me and a Caucasian guy who was so dedicated & focused doing his sets*i kasi salute* while i so easily get distracted lol. Best time to enjoy the pool is super early morning or late at night, you'll most probably get it all to yourself. Dinner and breakfast i had at the hotel itself, buffet style which makes one easily spoilt for choices. Being typical malaysian you would want to try everything but in reality our stomach says no lol, but they are all so tempting! 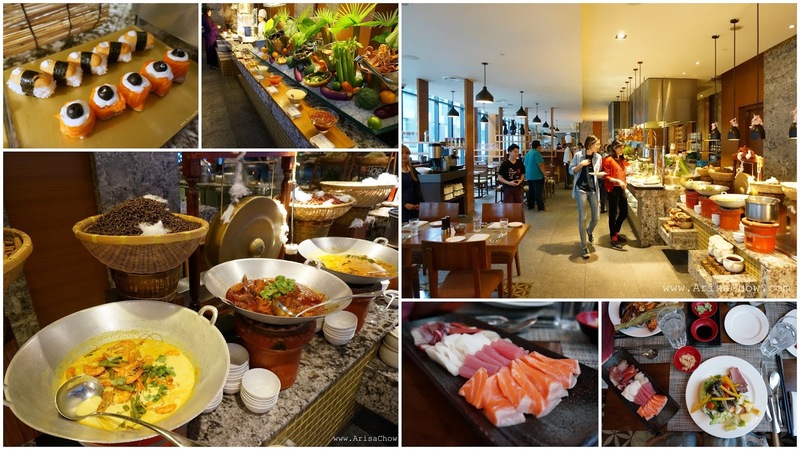 Serving large variety of cuisines such as our local favorites like nasi lemak, beehoon soup to western and Japanese dishes. If you are a fan of sashimi and seafood, you would most definitely head towards the Japanese counter first lol, since i was there during Halloween month you should have seen how cute their "gory body parts" inspired sushi was haha. There isn't much to see at night around the hotel grounds because most shops would have already be closed by 9pm+, so if you want to explore the area best do it in the afternoon (12pm onwards) that's when the crowd starts coming in and things starts to feel much livelier. Walking down 300 meters to your right as you exit (pass the vending machines) the hotel, you would come across the street filled with eateries, cafes, shops and of course Sanrio Hello Kitty town itself is around that corner too. It might not look much from the outside but the magic only begins inside! Welcome to the Red Bow Cafe, next to it is sanrio hello kitty town's official merchandise store. Upon entering you'll see Hello Kitty's Red bow cafe where you can get your sweet tooth cravings fixed with their super duper cute desserts and even browse through their official merchandise shop which is just beside the Red Bow cafe. 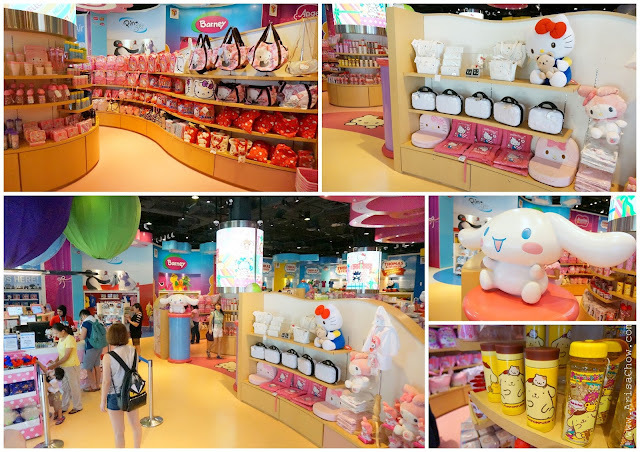 Shopping heaven for souvenirs, seriously everything in sanrio town is adorable! My previous blogpost was about Hello Kitty in Oz which you can read about it here if you had missed it, but there was actually more to this adventure than just Oz. Will be adding their blog links below so you can visit their blogs too! Some of them will be doing a giveaway like me, so head on over to join as well to stand a higher chance of walking away with a pair of Hello Kitty in Oz tickets. Inside sanrio hello kitty town, it's a land filled with picture worthy locations and every step you take you are sure to find a nice spot to capture a few shots for memory sake. And if you are lucky you'll get to meet Hello Kitty herself and Daniel (her BF) making their daily strolls around town, make sure to get a picture with this 2 adorable couple too. Though there isn't much activity to do in town unlike in the city of Oz, but nonetheless you would still have a great time touring the place while waiting for your turn in Oz. 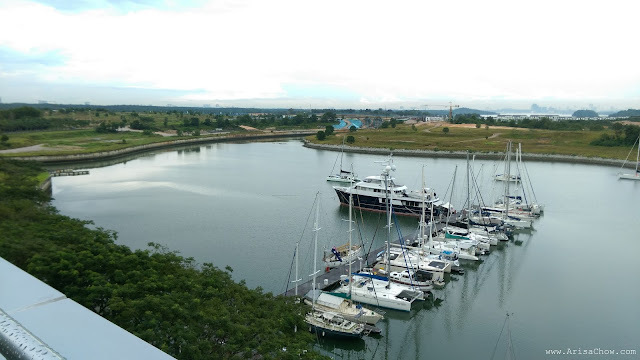 If you are done touring sanrio hello kitty town and Hello Kitty in Oz, you can also catch some fresh air by the docks and maybe grab a bite in one of the eateries below. So now, are you convinced on why you should book a room at Hotel Jen to enjoy your Johor stay? lol. If you are feel free to call them up to make your booking! Remember it's almost peak season due to year end holiday and festivals, make sure to book'em quick. Been trying to contain this excitement but i can't hold it back anymore so i am going to let it go! Lolwut, that just sounded like Frozen Elsa's lyrics lolol wtf. Because you guys have been so awesome supporting my blog, ramblings, crap and all i would like to take this opportunity to send 1 lucky couple (a pair) down to Sanrio Hello Kitty Town to experience Hello Kitty in Oz themselves! 2. This giveaway is open to Malaysians & Singaporeans only. 3. For each sharing you earn an entry point. The more entry point completed, the higher the chances of being picked by the app during the lucky draw (seriously lol). Incomplete tasks will be INSTANTLY disqualified. 4. There will be only One (1) Winner altogether and will receive the prize listed below : *pair of tickets to Hello Kitty in Oz & Limited edition Hello Kitty bowtie. **ArisaChow.com has the right to amend the terms and conditions of the giveaway subjected to availability of prizes and how the prize will be given/received. Trying my luck for a best friend, she loves Sanrio characters, especially Hello Kitty! 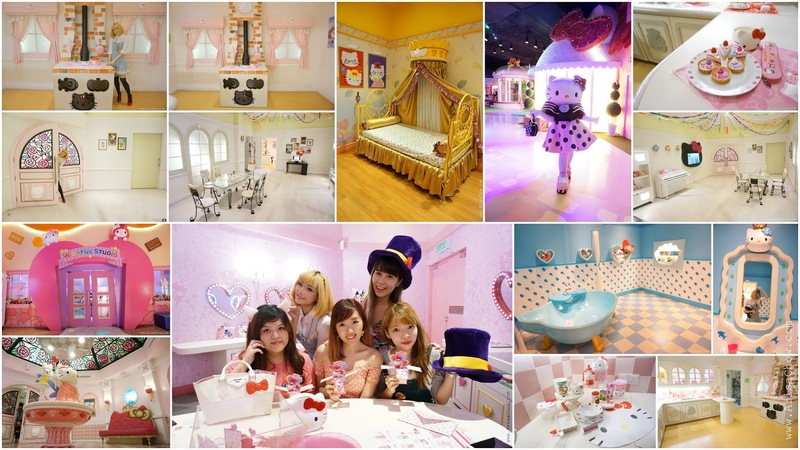 I wanna go meet hello kitty!~ and peep at the new Hello Kitty in Oz! lucky you dear! I love to visit this place one day. Its so kawaii! :-) it was a trip to remember.. Cuteness and comfort overload... Hehehe..
What a lovely hotel and the view is OMG! Not a great fan of Hello Kitty, but still love the overall HK theme. i like hello kitty too!! wish all participant good luck!! I like the Red Bow Cafe and all the cute Hello Kitty desserts. Such a nice trip. Nice post you had and nice meeting you on that day. We really had a fun time visiting the place. how convenient! everything's under one roof! i'll go there soon. Yeah just join the giveaway! I want to win it!! >< The view is so pretty and relaxing! not an extremely big fan of hello kitty, but i can appreciate the cuteness and pink hues of it all. Would bring my loved ones there if given the chance. The view from the hotel is so awesome, especially the bay!